Huey, Dewey and Louie Duck are fictional ducks who appear in animated cartoons and comic books published by the Walt Disney Company. Identical triplets, the three are Donald Duck's nephews. Huey, Dewey and Louie were created by Ted Osborne and Al Taliaferro, and first appeared in a newspaper comic strip on October 17, 1937. Their first animated appearance was in the theatrical short Donald's Nephews, released April 15, 1938. 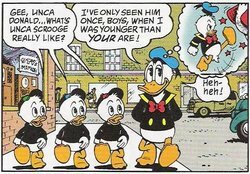 Huey, Dewey and Louie are the sons of Donald's sister; in Donald's Nephews, Donald's sister is named "Dumbella," but in the comics, her full name is Della Thelma Duck. In the original theatrical shorts, they were originally sent to visit Donald for only one day; in the comics, the three were sent to stay with Donald on a temporary basis, until their father came back from the hospital (the boys had wound up sending him there after a practical joke of putting firecrackers under his chair). In both the comics and animated shorts, the boys' parents were never heard from or referred to again after these instances, with the boys ending up permanently living with Donald. All four of them live in the fictional city of Duckburg. The boys are noted for having both identical appearances and personalities in most appearances, with the three sometimes shown as finishing each others' sentences as a running joke. In the theatrical shorts, Huey, Dewey and Louie would often behave in a rambunctious manner, sometimes committing retaliation or revenge on their uncle Donald for something he did to them. In the comics, however, as developed by Al Taliaferro and Carl Barks, the boys usually are shown in a more well-behaved manner, usually helping their uncle Donald and great-uncle Scrooge McDuck in the adventure at hand. 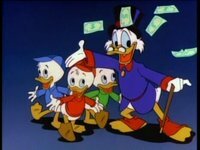 Since the production of the 1987 animated series DuckTales, Huey, Dewey and Louie can usually be told apart by the color of their hats and/or clothing: Huey dresses in red (although he used to wear orange), Dewey in blue, and Louie in green. Disney's archivist Dave Smith, in "Disney A to Z," said, "Note that the brightest hue of the three is red (Huey), the color of water, dew, is blue (Dewey), and that leaves Louie, and leaves are green." Before DuckTales, the colors were not applied to the individual characters consistently; each character looked the same until colored, and often which colors belonged to which duck were decided by the colorist.